Urban Design Flowers understand that buying flowers for different people and occasions can be a challenge, so we have written this informative guide to help you through the process. How do I choose what to send? Consideration should be given to the occasion that the flowers or gifts are for. On most occasions the colour and flower choice is down to personal choice or the taste of the recipient. For a lot of people the colour choice is most important and is often made according to season and we do always have a seasonal collection online. Birthday flowers, Anniversary Flowers and most other flower purchases are most frequently chosen according to personal taste. There are of course landmark occasions, such as, 21st Birthdays, 30th, 40th, 50th, and so on. You can find a selection for these occasions in Special Birthdays. Romance is frequently shown by sending red roses. Most frequently The Choice of Flowers for the birth of a baby is. Blue for a Boy, Pink for a Girl. Colour is not always the only reason for choosing you flowers in can also be defined by the meaning of flowers, known as Florigraphy. Can I order my flowers online and collect? You can order on line and collect from store. You need to give 2 hours notice for collection. If you need your flowers sooner please ring us on 0121 777 9789 and we will endeavour to meet your requirements. Before choosing what tribute would be most suitable for your needs, take a little time to think about what type of flowers the deceased liked or what their favourite colours were. If ordering for a lady we would suggest soft colours such as pinks lilacs& white etc, for a gentleman we would suggest stronger colours such as oranges, yellows, etc. Deciding on what flowers to send to a funeral is frequently decide by your relationship to the deceased or bereaved family. Our guide provides useful information and is a general guide to help you choose the most suitable tribute for your budget & needs. At Urban Design Flowers our range caters for a wide variety of colour and floral themes across a wide range of varied tributes and caters for the most discerning of taste and budget. Double Ended Coffin Sprays are usually chosen by close family members or friends. These items can be made in various sizes usually starting at 3ft and ranging up to 6ft also bespoke sizes on request. Crosses A Family tribute, also suitable to be sent by a Christian religious order. Funeral Sprays are undoubtedly the most popular of all tributes; they come in double ended and single ended designs. Double ended Sprays are sometimes referred to as Coffin or Casket Sprays and frequently used to sit on top of and decorate the coffin/casket. Single ended sprays are also most suitable for close family, friends and colleagues. Both styles of sprays are available in a wide range of styles, colours and sizes designed to suit your specific requirements. Posies and Baskets can be designed in a range of traditional or modern styles and can be sent to a funeral or as an expression of sympathy to the bereaved family. Tied Sheaves are the perfect tribute to send to a funeral and then be sent on to a home address after the funeral as an alternative to the common Funeral Flowers in Cellophane. Wreaths. A more formal tribute and most suitable to be sent by companies, clubs, and associations. Wreaths are available in a range of sizes and styles to suit all budgets. Hearts. The most suitable tribute for a loved one. It is the deepest expression of the loss of a loved one. Letter Tributes are usually from family members, close friend or an association. They are one of the fastest growing trends in floral tributes and can be made in any chosen name or word. Where would you like the flowers delivered? To a residential address. We require the following information. Deceased's name, delivery date, delivery address and the time the funeral leaves the house. If you're not sure of the funeral time we will endeavour to find this out for you or deliver the flowers early morning to make sure they arrive in good time for the funeral. In all instances we deliver your order 1 hour before the funeral leaves the house or earlier to suit your requirements. To a Funeral Director. We require the following information. Deceased's name, delivery date, funeral directors name and address. In all instances we liaise with the funeral director and deliver your order according to their requirements, ensuring your order arrives in good time. If you are in any doubt or don't have all the details please call us on 0121 777 9789 and we will endeavour to help you. To a Church, Cemetary, Crematorium or place of worship. Whilst deliveries can be made to any of these addresses it is not recommended as there is often no one to sign for the flowers. However, we encounter very few problems when delivering to these types of addresses and always strive to make sure a safe delivery is made. What type of message should I send with the flowers? Like most things, keep it simple. Just a few words of sentiment will be appreciated. Some examples are provided below. "With fond memories of (name of deceased) from (Your name/s)"
"In loving memory of a dear friend, with love (Your name/s)"
"Dearest (name of deceased), May you rest in peace. Love from (Your name/s)"
"With deepest sympathy from (Your name/s)"
"Our hearts are filled with sorrow. Rest in Peace Love from (Your name/s)"
"(name of deceased) you will always be in our hearts and minds Lots of Love (Your name/s)"
When ordering larger tributes please give at least 48 hours notice, for smaller tributes order before 5PM the preceding day. It may be possible to execute order with less notice but you would need to contact us on 0121 777 9789. Birthday flowers, Anniversary Flowers and most other flower purchases are frequently chosen according to personal taste. There are of course landmark occasions, such as, 21st Birthdays, 30th, 40th, 50th, and so on. You can find a selection for these occasions in Special Birthdays. Land Mark Anniversary Flowers are also catered for in our Anniversary Flowers section. Floral designs can be created to match these occasions and to help with your decision, when choosing flowers for an anniversary, colour is often the deciding factor e.g. Ruby anniversary's would mainly consist of a bouquet of toning red flowers. Listed below are the major anniversaries. We can arrange same day delivery if your order is received before 2:00 PM. If it is after this time and you require a same day delivery please call us on 0121 777 9789 and we will endeavour to help you. If the recipient isn't home we will try to leave them with a close neighbour and leave a calling card at the recipients address informing them of where the flowers have been left. If this isn't possible we will leave a card asking the recipient to contact us to arrange another delivery or collection. Do we deliver to hospitals? We do deliver to hospitals we always check if flowers are allowed on the ward and if the patient is still on the ward. A full refund will be arranged if for one of the aforementioned reasons we are unable to deliver. We can accept orders for your chosen day of delivery but are unable to give a specific delivery time, other than for funerals, (you will be able to request a time at the checkout). Gift orders will be delivered between the hours of 8am & 6pm in most cases. If your delivery is to a work address please state the time the recipient leaves work at checkout and we will deliver your order before that time. When will my flowers be ready? 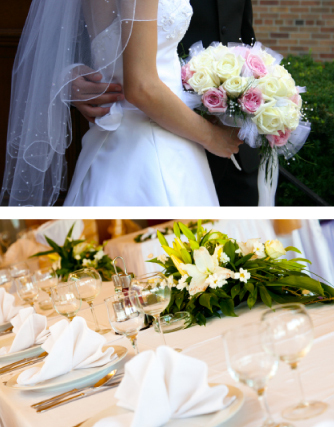 In most cases your flowers will, be ready 2 hours after ordering, however, larger or more complex items can take longer. In general funeral tributes take more time to make and you will be notified of the earliest time you can collect at the checkout.